There's no drought problem in California. It's all an illusion according to Donald Trump. 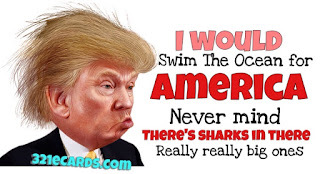 Trump, who said plainly that "there is no drought," is implying that water that could be going to farmers is instead being used to ensure the survival of a near-extinct fish native to the Sacramento-San Joaquin River Delta. As Trump put it, state officials are diverting precious crop water "to protect a three-inch fish," at the behest of environmentalists. Never mind that the amount of water being diverted wouldn't begin to solve the water shortage problem in California. Trump threw out the bait and hopes to snag a lot of under-educated people in his net. Pandering to the fears of populace after populace, Trump's told the working-class people of Indiana he'd do away with outsourcing; the people of North Dakota (America's second-leading producer of oil) he'll do away with energy regulations, and he told the coal miners in Virginia he's going to reinvigorate the coal mining industry by doing away with the EPA. Trump will promise anything to get elected. Anything. He says what people want to hear, despite the fact his solutions (if he even offers any) are simplistic and wrong-headed. How far will pandering take the Donald? It's hard to say. So far he's managed to appeal to half of the Republican base - the under-educated angry white men, with success. Hopefully, when it comes to the general election, the rest of the country will have more sense than to elect a demogogue.